Welcome to Three Book Thursday, a series all about the joy of sharing books with children. We’re kicking off our summer today and that means we’re all signed up for summer reading at our local library! 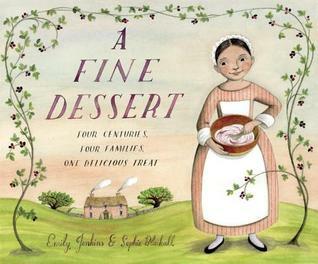 So this week, I’m featuring picture books that highlight learning and include recipes for a summer dessert, because there’s no better way to kick off summer reading excitement than with a hands on opportunity! (And as a homeschooled kid turned homeschooling mom, I can tell you that finding a good book with a recipe to go with is finding solid gold). A Fine Dessert is a fun history lesson about the centuries old dessert, Blackberry Fool. Starting with a mother and daughter in England in the 1700s, we see how the process of cooking changes a little bit but the basic concept of delicious food bringing families together stays the same. This book will make your kids appreciate grocery stores and electric mixers! We had opportunities to talk about all sorts of concepts, from colors of dishes to slavery in the 1800s to different kinds of grocery stores. And if you make the very simple recipe at the end, you’ll also give your children an opportunity to get their hands really dirty and be proud of a new accomplishment. Our children gobbled up the Blackberry Fool. As a side note, no one really knows why it’s called “fool.” Of course, the kids sure do love an excuse to use an off limits word in a different context. (insert eye roll + amused smile). Even if you don’t get to make the recipe, the illustrations are delicious in themselves and the book as a whole is one of our new favorites. 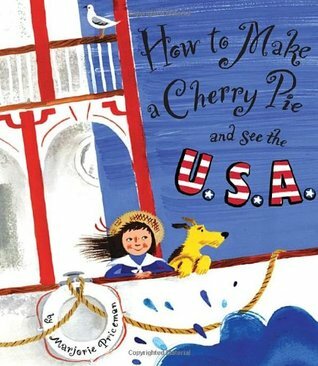 How to Make a Cherry Pie and See the U.S.A. has our mouths watering and our wanderlust screaming at us to take a road trip! (oh, maybe that’s just my wanderlust…. moving on). It’s such a great book to start your summer reading with. We loved following along with a map as the children in it start in New York City, travel down the Mississippi on a river boat, and hit up a few lesser talked of states for the necessary supplies to create a delicious cherry pie. I would even suggest starting with this book instead of its predecessor, How to Make an Apple Pie and See the World. We’re finding that it’s easier for young children to understand the geography of their own country than the starting off with the whole, unfamiliar world. Children are as curious as can be about geography, though, so whichever book you start with, I can almost guarantee the wonder of a map will draw them in and the promise of some pie making fun will seal the memory as one of the best geography lessons ever. Thunder Cake is THE book to read in the late afternoon on a stormy summer’s day. 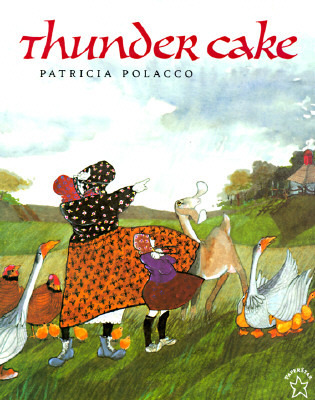 Patricia Polacco makes you feel like you’re right in the midst of the glowering clouds and yellow light of an approaching storm on the prairie. The narrative of the grandmother and her young granddaughter hurrying to beat the storm gives readers an exciting story to follow even as they’re learning how much work it was to cook before electricity was in our homes. The recipe at the end is a bit more complicated than the Blackberry Fool and Cherry Pie recipes, so we have yet to try it. Also, we’re all a bit wary of a cake recipe that includes tomatoes….but I’m planning to have an update on its outcome by the middle of the summer for you! Even if you never make the recipe, it’s a wonderful book.